Depending on who you ask, Google Chrome is the world’s most popular browser here in mid-2012. It’s fast, lightweight, and standards-compliant. However, Chrome has one major (for me) issue that will prevent me from ever using it as my primary browser: The lack of any way to modify the behavior of the Ctrl+Tab keyboard shortcut to switch between tabs. Like the other leading desktop web browsers Firefox and Internet Explorer, the default behavior of the Ctrl+Tab keyboard shortcut in Chrome is to switch between tabs in left-to-right order. I’ve believed for years that this behavior is inefficient at best, and the default switch order for Ctrl+Tab should be most-recently-used (MRU) order. The default left-to-right Ctrl+Tab switch order makes it impossible to quickly use the keyboard to toggle back and forth between two tabs when there are multiple tabs open. Left-to-right order is also inconsistent with the long-established MRU order for the keyboard shortcut for switching between open applications (Alt+Tab in Windows and many Linux distributions; Command+Tab in OSX). Chrome: There’s no configuration setting to change the Ctrl+Tab behavior. The Ctrl+Tab key combination apparently is defined as “reserved,” so extensions can’t change its behavior either. Ctrl+Tab, Ctrl+Shift+Tab, Ctrl+PgUp and Ctrl+PgDn can all be used to switch back and forth between tabs. While there is great demand for an MRU-ordered switcher, we've so far been unable to find an MRU switcher that makes sense beyond the first three most recent tabs, or one that works well with background-created tabs. I’m somewhat bemused by this statement; there are many good reference implementations of MRU switching order available. One specific example is the LastTab Firefox extension mentioned above; I’ve used that for years and have been very happy with it. If you’d like to add your vote to this issue, feel free to head over to Chromium Issue 5569 and “star” the issue and/or leave a comment. This issue is a deal-breaker for me to consider adopting Chrome as my primary desktop web browser – Chrome’s benefits don’t outweigh the potential several-times-per-day productivity hit of not being able to rapidly and easily toggle between two specific browser tabs. In the meantime, I’m happy to continue using Firefox as my own primary browser. In occasional situations where I do need to use Chrome and have multiple web pages open, going old school and opening each web page in its own browser window (instead of using multiple tabs) is a tolerable workaround (since that lets me use the operating system’s MRU window switching behavior to rapidly toggle back and forth between two windows as needed). 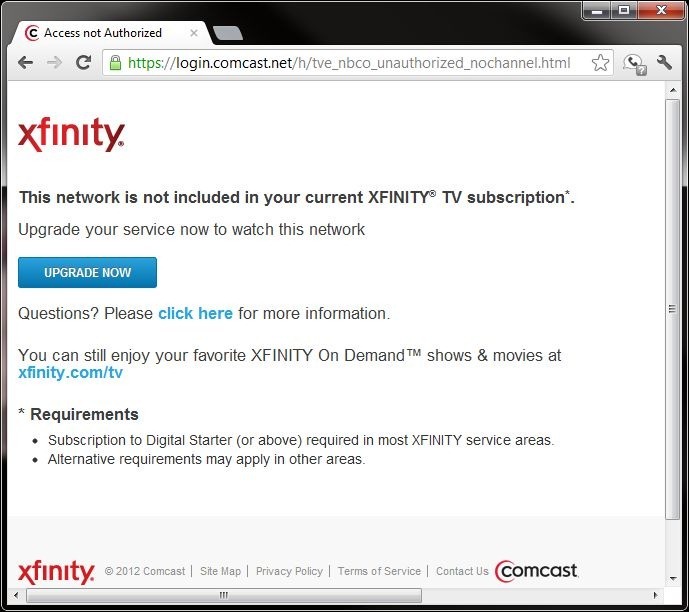 Comcast Internet subscribers can’t watch college football online via ESPN3 this fall? Update 8/19/2012: I just tried again watching a couple of different live sporting events at home via espn3.com, and today, it worked fine -- I wasn't blocked. Barring any word on this from Comcast or ESPN, I guess we'll just need to wait until kickoff to see if watching college football on espn3.com this fall via an Internet-only Comcast subscription is going to work or not. Update 8/30/2012: ESPN has posted an WatchESPN / ESPN3 FAQ. In short, it sounds like ESPN3 now only carries "online-exclusive" content -- that is, minor games that aren't being shown on ESPN/ESPN2. To watch ESPN content that's being shown on TV online, you need "WatchESPN" -- and that requires a paid TV subscription to ESPN (on top of a broadband Internet subscription). So, Internet-only customers are out of luck this year, sounds like. :-( Maybe ESPN will sell their content directly to consumers in the future, like Major League Baseball has already figured out how to do. You can buy an entire season of MLB (thousands of games!) for $20 or $25, depending on type of device; I'd happily pay $25 for an entire season of college football. For the last 3 years or so, I have not subscribed to any cable or satellite TV service, going instead with free over-the-air HD network television via a DIY antenna, and using AT&T DSL and (later) Comcast cable for Internet service. I’m a college football fan, and in the fall, I have for the past couple of years used the very nice service at espn3.com (now rebranded as WatchESPN) via my HTPC to watch college football games that were shown on one of the ESPN network channels, but not shown on the ABC network (which I can watch in HD for free via antenna). Apparently something has changed in the arrangement between ESPN and Comcast Xfinity – without any notice to me, the customer – where it’s now not just checking to see if my ISP is supported by ESPN3; it’s now additionally checking to see if I have a television subscription through that same ISP (Comcast), which I do not. 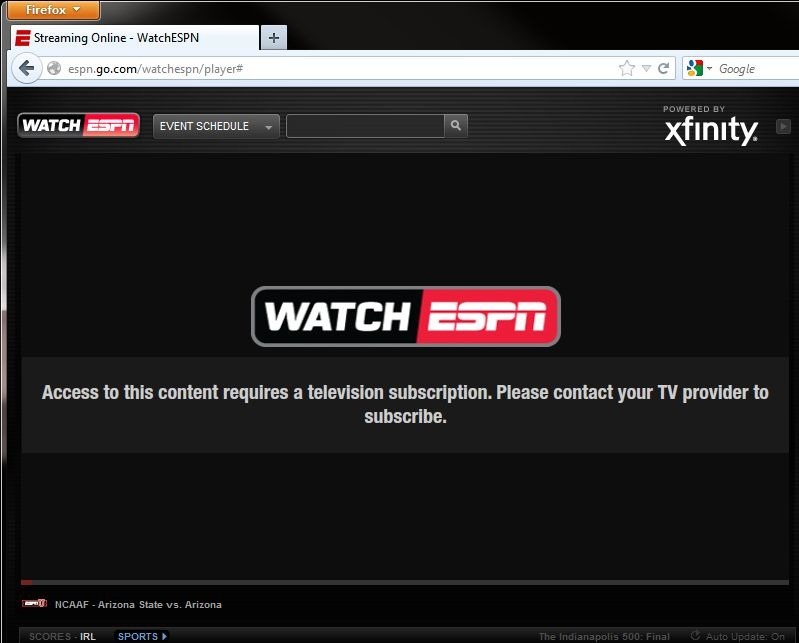 If I did have a full television subscription, I wouldn’t be trying to use espn3.com; I’d just turn on my television! Apparently this is the new trend, as I also found just last week that my family is not permitted to access any of the live 2012 Olympics coverage currently available in the United States via nbcolympics.com, for the same reason: I only have an Internet subscription through my ISP, not a full television subscription. From a standpoint of trying to be fiscally responsible, it isn’t worth it to me to pay an additional $200 to be able to watch 14 Saturdays’ worth of college football from home this fall (figuring about an additional $50/month for the duration of the 4-month college football season for a television package from Comcast that includes ESPN, above and beyond the Internet service that I’m already paying for). So it looks like I’ll be visiting friends’ homes or going to sports bars to watch any college football game that aren’t being shown on the broadcast networks (ABC, CBS, and for Notre Dame home games, NBC) this fall. Guys, if you’re reading this, I’ll bring the beverages! This development is pretty disappointing, to say the least. I’d consider switching ISPs – if Comcast didn’t have a local monopoly on high-speed Internet at my location. Hopefully, in the future, ESPN and other content providers will figure out how to profitably provide their coverage directly to consumers via the Internet, regardless of ISP. Clearly, the technology is ready and available (it worked great for me for the last couple of college football seasons prior to this year); it’s just the business side of things that needs to be worked out.